More than a year ago, we replaced our porch light switch to automate our lights and it’s been one of the best things ever. I really hated coming home to a dark house at night and it’s also not that safe. But if you forget and leave the porch light on during the day, you waste electricity. As we figured out what to install at our own home, we narrowed it down to three great options for automating your porch light. Check out our video below for details and hands-on testing of several switches in this review. In this article, we are going to go over the automatic porch light timer options more in-depth. We will also show you exactly how we installed it for our house near the end of the article. Porch lights don’t have to be as fancy as some of the really awesome smart lights available. All you need an automatic porch light timer to do is turn on in the evening and turn off when you are in bed. There are some basic, inexpensive options that can get the job done. In this article, we will start with the cheapest and simplest options for automating your front porch and end with the more advanced smart light switches. 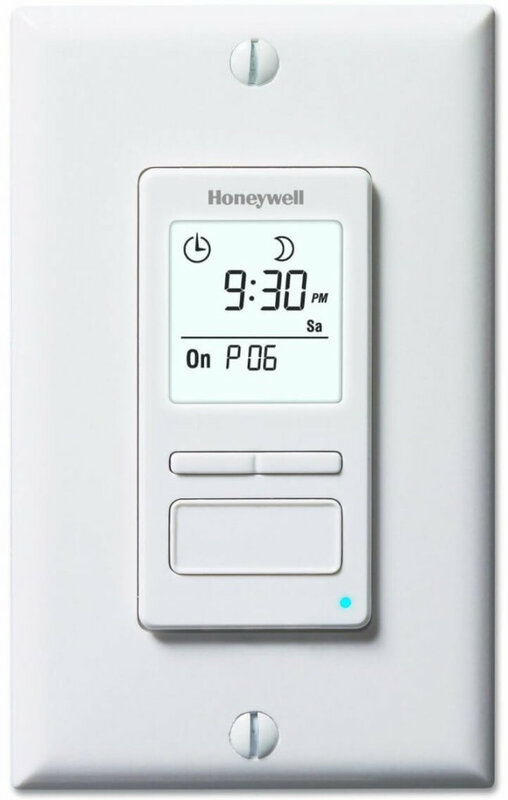 This first light switch will automate your porch lights, but isn’t technically “smart.” In other words, Honeywell Econoswitch won’t talk to other devices in your house, but that might not be a problem if you don’t care about using Alexa, SmartThings, or other smart home automation. You set it up from the three buttons and small screen on the device, which makes installation very straightforward. The design of the switch allows it to sit flush with standard wall plates, so it won’t be a distraction on your wall. Its back-lit display looks really nice, with details like the date, time, current status of the light, and more available at a glance. For its cheap price and basic functionality, it still has some impressive features. Econoswitch can automatically adjust the light timers with the changing seasons when you specify your location, so you can have your porch lights turn on at sunset and off at sunrise daily. Up to seven schedules can be programmed to have the lights turn on and off at different times everyday, or the same program repeat all week. At the time of writing this article, it had the highest reviews on Amazon out of the three. Simply set it up and it takes care of your automatic porch light timer without any additional headaches. The Wemo Light Switch might be the best-known smart light switch timer. Besides using the Wemo app to schedule your lights, the switch also works with Alexa and Google Assistant to turn the lights on or off with your voice. The nice thing about Wemo devices is that you don’t need a hub, bridge, or any extra hardware to control it from your phone. Just connect the Wemo Light Switch to your WiFi and you can control the porch light switch anywhere you have internet access. This is a perk over Econoswitch, which doesn’t offer remote controlling. In the Wemo app, you can also set timers and sync with the sunrise and sunset at your location. You can turn on vacation mode to randomize the lights and make it look like you are home. The same app controls all of your Wemo outlets, switches, and dimmers, so if you have other Wemo devices around your home then it makes sense to get this light switch. Wemo integrates with several other smart home services, including IFTTT and Nest. Using Home/Away Assist with Nest, you can automate your lights with your thermostat, to have them automatically turn on or off when you come and go. A good competitor to Wemo is TP-Link; you can check out our comparison of Wemo vs TP-Link for more information. 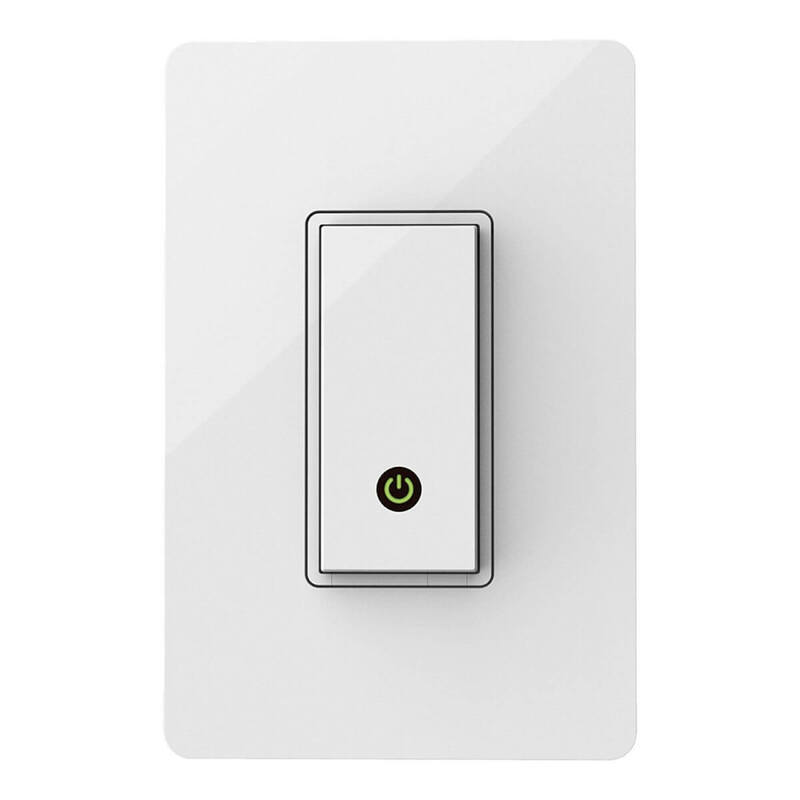 The GE Z-Wave light switch is a great option for those with a SmartThings or Wink hub. Using the Z-Wave protocol, you can easily connect this switch to either hub and build it into your smart home setup, allowing you to control your porch light in the same app as all of your other smart home devices. This is the switch we selected, so scroll down for installation details and our impressions of it. This porch light switch is also compatible with Alexa, but you need a Z-Wave compatible hub (like SmartThings or Wink) to let it work with Alexa. Once you have it connected to a hub, you can also get it working with all other Z-Wave devices on your network, from smart locks to security cameras to thermostats and more. One practical example is syncing the light switch with your other Z-Wave lights around the home to have them all turn off at bedtime. GE offers two versions or light switch styles: the Toggle Switch and Decora style. Similar to Wemo, you can schedule or control the lights from anywhere using an app. The difference is that this device requires you to use the hub’s app instead of its own. While this can present a learning curve at first, once you figure out how to control all of your smart home devices on your hub, it’s easier in the long run. If you don’t have a Z-Wave hub and aren’t planning on buying one, then the other options will be a better fit for you. This won’t be a typical comparison because each of these options function similarly. For example, they can all automatically turn the lights on and off at night and randomize the times so people think you are home. Your final selection between these options will just depend on your preferences and what devices you want to connect with. All three light switches require a neutral wire for power, which is why you will absolutely want to check the wiring in your light switch before purchasing. The neutral wire is commonly white; you can find out if you have a neutral wire by reading on to Our Setup, which shows our neutral wiring as an example. You can also follow these detailed instructions to find out if you have a neutral wire. 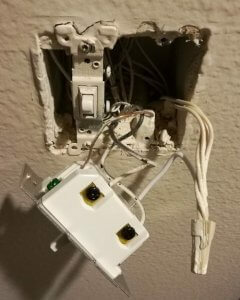 If you follow the steps to check for a wire and find that it’s missing, then these light switches will not work for you (unless you want to pay an electrician to add a neutral wire). 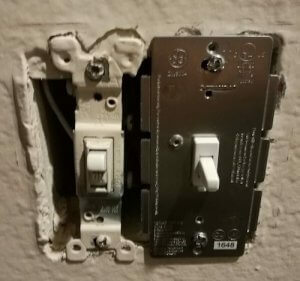 For that reason, it’s definitely important to confirm you have a neutral wire wherever you will install this light switch. 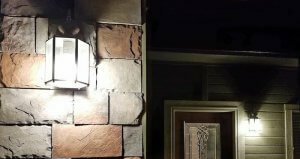 These porch light switches all work with compact fluorescent lights (CFLs). In addition, they also work with indoor or outdoor lights including incandescent, halogen, and fluorescent lighting. They also work with LED light bulbs if that’s your preference. The switches can also work with fans and pool/pond pumps if you want to use them to schedule these other devices. If you want to use dimmable lights, look into the second and third options (Wemo and GE Z-Wave), which both offer upgraded versions of their basic light switches. 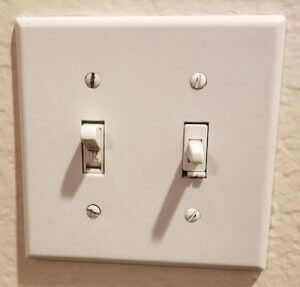 By upgrading to these more advanced light switches, you’ll be able to dim the bulbs to your exact preferred brightness. As a side note: these switches also work for more than just your porch lights. You can actually replace any light switch in your home with these smart solutions, for automated lighting throughout the home. We find that these are ideal solutions for an automatic porch light timer, but feel free to get creative on where you use these switches. 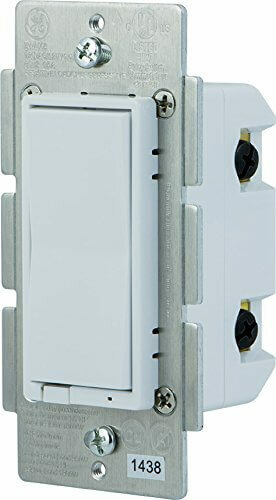 We ended up going with the GE Z-Wave light switch because we have a SmartThings hub and I find Z-Wave to be very reliable. After using it for a full year it has turned on our lights every evening without fail, and turned them off according to our schedule. This is great for solving the annoying issue of trying to remember to turn the porch lights on and off daily. Find the neutral wire. 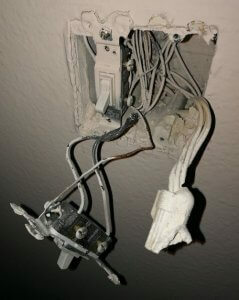 I first pulled out our existing switch and had to look in the back for the neutral wires. The neutral wires were all capped together as seen below. This is a common look for neutral wires, so if your wiring looks something like this, then you probably have a neutral wire. Connect the wires. Then I pulled the wires out of the old switch and plugged them into the new GE switch. I also had to connect the neutral wire from the switch to the bundle of neutral wires. I did this by removing the cap on the neutral wires, twisting in the switch’s neutral wire, and then replacing the cap. That way the switch can have power and connect to WiFi. Install the plate. The GE switch fit nice and snug next to an existing normal light switch. We secured it to the wall and then put the plate back on. Afterwards, the switch worked as you would expect and we were able to get it synced to our SmartThings setup following the instructions laid out by SmartThings. The entire installation took just a few minutes total, even though I’m not very handy and have been confused by the wiring of light switches before. Of course, this can vary from home to home based on how your lights are wired, so you may see something different when swapping out your switches. We ended up going with the dimmer version because it was cheaper at the time of purchase. I made sure to put LED lights in the front that were dimmable so they wouldn’t explode. As we mentioned above, any automatic porch light timer will work with your fluorescent bulbs, so no need to worry there. Remembering to turn on and off the porch lights was a major pain. This was one of the best ways I have spent a little money on my home. And it will probably save you some money on your energy bill if you always forget to turn off your porch lights. Automating your porch lights is an easy, helpful fix to add to your growing smart home, or even if you are just starting. Let us know in the comments if you have any questions about installing an automatic porch light timer!